June 1, 2 and 3 were special: 4 members of the Brothertown Indian Nation were in town to visit the grave-sites and former homes of their ancestors. They were Courtney Cottrell, Brothertown Indian Nation's Tribal Historic Preservation Officer; Amy Besaw Medford; Rebecca Anderson; and Jeanenne Thompson, all Brothertown Indian Nation Members. Also visiting was Jeanenne's husband Ken Thompson. The weekend started off at Burke Library at Hamilton College, where Christian Goodwillie, director and curator of Special Collections and Archives presented any items the library had on the Brothertown Indians and Samson Occom. They were read from the later transcriptions from the 1800s. Hamilton College's library has fantastic archives, and Christian couldn't have been nicer or more accommodating. On Saturday, the members of the Brothertown Nation joined some members of the Historical Society for a luncheon, before they set out to visit local cemeteries and burial grounds. 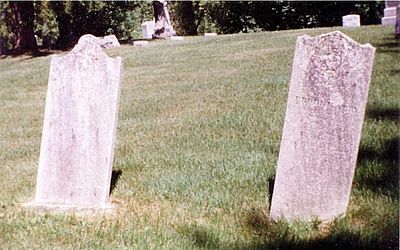 A surprise: the headstone of one of the Brothertown Indians who was buried in the Deansboro cemetery which I could not locate was found by Troy Bishopp - it had broken in two - and propped against another headstone for all to see.